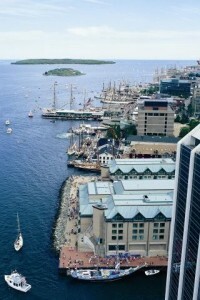 It’s impossible to walk along the Halifax waterfront without seeing the Historic Properties, a collection of restored buildings and warehouses that are now filled with unique boutiques, art galleries, cafes and restaurants. Shopping and dining aside, it’s worth a look alone to see 10 of Halifax’s oldest buildings. Privateers Warehouse is the oldest of the group. Built in 1813, it was originally intended to hold the booty from legalised privateering raids on ships off New England. Today, Privateers Warehouse houses the Lower Deck, one of many popular watering holes along the harbour. It’s a good place to check out live music. The Historic Properties are open year round but summer is the best time to check out the area, when the weather is good for wandering between the buildings and other nearby attractions like Citadel Hill, the Maritime Museum of the Atlantic and Pier 21. Several festivals also centre on the Historic Properties, including the Tall Ships Festival in July and the Busker Festival in August. Things get crowded when there’s an event on and you may have to park further away than normal.